The tall slender teen who approached 15-year-old Sudbury goalie Cam Lamour in the arena lobby was dressed in a perfectly fitting suit and tie; he was wearing gleaming polished shoes and a big smile. He held out his right hand to shake Lamour’s and congratulated the Sudbury player on a great performance. It was mid-March, in Toronto. Moments earlier, the two players faced each other in a hard-fought match. They were among hundreds of elite players from 20 minor midget AAA teams from across the province competing in the annual OHL Cup tournament. I am not a hockey fan. 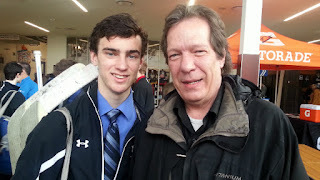 I was at the game only because my good friend John O’Callaghan is a great-uncle to Cam Lamour, and John had told me about how proud the family is of the young player. “I think you’ll get a kick out of this,” he said. It was one of the highlights of my winter. And I’d attend another game like this in a heartbeat. Here’s why. At a top-notch tournament like this, the players are the country’s finest. As many scouts and agents as hockey moms fill the bleachers. You can read most of the players’ bios at www.eliteprospects.com. Lamour, who usually plays goal for the Sudbury Midget Wolves, was on this occasion minding nets for Team NOHA , a collection of all-stars from various squads around area-code 705. Team NOHA consists of fabulous players, but they’re not a regular club. Contrast that to the team they had just finished playing. The guy congratulating Lamour was Akil Thomas, the leading goal scorer for the Toronto Midget Marlboros. Given their links to the Leafs, their roots and the fact that they’re in Canada’s largest city, the Marlies might actually be the finest collection of young athletes of their age in the world. One of the players has “Antropov” stitched across the back of his jersey. Turns out he’s Danil, son of retired Maple Leaf Nik, who was in the stands when the Marlies met Lamour’s team. And the one named Spott? That would be Tyler. His father’s the assistant coach of the San Jose Sharks. Star forward Thomas moved from Florida to play with these guys. His dad, Khalil, is also a former pro. To watch them is to witness youthful athleticism at its finest. Even I—a non-hockey fan—could appreciate the finesse. They’re a blue-and-white machine in which every player knows exactly what his team mates are doing at any given time. And the thing is, they only beat Team NOHA by two goals, one of which was on an empty net during the final moments of the third period. Team NOHA’s supremely valiant effort, especially when they went into overdrive in the last period, holding their own against the blue behemoth almost to the point of beating them, made me surprisingly proud to be part of the Sudbury cheering section. I can’t stop talking about the game. For one thing, just seeing dozens of young men from all corners of the province in jackets and ties at 8:00 in the morning lugging their huge hockey bags into the arena is good for your heart. They’re shiny clean and smiling and they’ve worked harder to get here than I’ve ever worked for anything, ever. But showing up the arena and watching them bust their backsides at dawn, surrounded by caring moms dads and coaches yanks a person like me deep into the excitement. I can’t believe how invested I became in the game. Especially when I saw John’s niece’s son Cam under all that pressure. Really. Being a goalie is a huge responsibility. You’re the last hope right? Team NOHA was also a tad penalty prone. At one point Cam only had three forwards out there, two of his team mates were in the penalty box. I was fretting for the team and feeling very badly for a guy I’d never even met before. The game also reminded me that—in a time when professional athletes move from city to city like mercenaries--when a sports franchise like Team NOHA really does represent a place a person comes from, it’s easy to get and stay behind them. It’d watch these players anytime. Are you paying over $5 per pack of cigarettes? I'm buying my cigs at Duty Free Depot and I'm saving over 60% from cigs.